By Monday evening the snow had disappeared. The temperatures warmed throughout the week. Yesterday evening we had rain rat-tat-tatting on our roof. It looks like rain again today. I love each of Michigan’s seasons. Autumn’s colors are breathtaking and there is an vigorating chill in the air. Winter is magical when the landscape is clothed in white and the wildlife comes close to the house to eat from the birdfeeders. Spring is exciting when the plants begin to poke above the ground and the flowers bloom. It’s wonderful to work in the garden during the Summer and to enjoy green leaves, beautiful wildflowers, campfires, t-shirts and shoes instead of coats and boots. Of course, Winter is challenging because of our long, steep driveway that we have to keep snow-blowed. Warmer months are challenging because the creepy-crawlies wake up. Since yesterday I have encountered three wolf spiders. One was right up on the threshold of our front door. They especially seem to like snuggling right up to the bottom of the door, which means that if I open the door, they are likely to drop inside the house. When I saw the spider as I stepped onto the porch, I grabbed a straight-edged shovel to move it away. I wasn’t deliberately trying to kill it but it left behind some of its legs when it hobbled off. Probably to die. Oh, well. I know there are spider-lovers out there, but I am not one of them. I figure there are billions and billions to the nth power of spiders in the world, and they will not become extinct if I kill a few. I let them live if they remain outside, but I kill them if they are in the house. Or near the house. Or on me. Or in my personal space. A few hours later, a second spider dropped down from the ceiling onto the porch when I opened the door to go outside. I thought, “Great! Now I have to be alert for spiders falling from the ceiling!” I’d have had to walk over the spider so I quickly shut the door, found my spider spray, and then when out and sprayed it until it was dead. I saw a third spider lurking near the door inside the house in our entrance hallway this morning. It was small. I stomped on it. I have put traps in strategic places throughout the house to lure creepy-crawlies to their deaths. I have to be careful now with sprays because, for some reason, Hannah Banana likes to try to lick the places where I have sprayed. We can’t have that! So I bought pet-safe traps and put them in out-of-reach places around the house–like inside cabinets, under furniture, and in closets. Last weekend–I think it was Saturday–I had sort of a chicken misadventure. About 4 pm each afternoon, I go out to give the chickens fresh water and gather their eggs. The chickens always run up to me when they see me coming. Fun Fact: I’ve read that chickens consider the humans who care for them as honorary members of the flock. 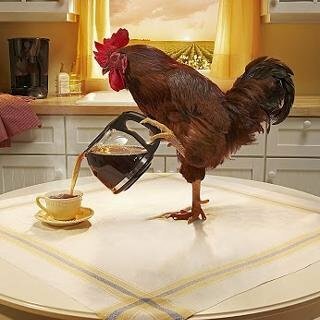 If a rooster believes his human to be lower in the pecking order, he will try to boss the human around. I think this is what happens when roosters are mean–they consider themselves to be dominant and they are trying to get the human “in line.” When my roosters were chicks, I made sure to establish my dominance–I would occasionally “nudge” them with my cane when they fluffed their feathers and got sassy–so my roosters consider me Chicken Leader One and they are quite nice. Anyway, when the chickens crowd the gate, it is a bit tricky to get through it–I have to shuffle through the gate so I don’t step on any of the chickens crowding around me while carrying the egg basket and bucket of water, and then get the gate closed again before any chickens get out. I’ve never had a problem with them escaping–until Saturday. Sassy, our primary rooster, squeezed by me before I could get the gate closed. Chickens like to be with the rest of their flock so all I had to do was open the gate and steer him in the right direction and he would go right back in…except all the other chickens were crowding the gate so when I held it open for Sassy, a hen escaped. Now I had two “free” chickens. I couldn’t keep the gate open for Sassy and the hen without letting more escape so I ran inside the house, shouted to EJ that I needed his help, and ran back out to make sure Sassy and the hen didn’t wander too far away. When EJ joined me, I stood near the garden gate while he walked toward the escaped chickens. They ran toward the gate, I opened it, and in they went. Easy peasy. The chickens always put themselves to bed in their coop when twilight descends. I simply go out and make sure they are all inside and then I close their little door so they are safe from nighttime predators. Usually Sassy and six of the hens roost on top of the TSC coop inside the shed while Captain and his two hens roost inside it. I feel like Mr. Tweedie in the Pixar movie Chicken Run when I shine my flashlight at them to count them to make sure they are all in. Sunday evening when I went to the coop, I counted only eight chickens. I was heading out of the coop to see if I could find the missing chickens when I heard a loud clucking as if one was saying, “Here we are!” We have three dog houses in various places outside so the chickens can run into them for safety if there are predators around. Fortunately, the crows in our Enchanted Forest chase away flying predators. I saw two crows driving off a hawk a few days ago. Anyway, Captain Ame-roo-ca, our second rooster had gone into the dogloo with a hen when it started snowing and they didn’t want to walk through the snow later to go into the coop. My chickens hate snow. The hen came up to me when I neared the dogloo so I picked her up and took her into the coop. However, Captain didn’t want to leave the dogloo. I had to get out my rubber-footed cane, which I use like a shepherd’s staff, to reach in and nudge him out of the coop. It took a bit, but he finally came out. He ran across the snow and got into the storage part of the coop where we keep the food and straw. However, Sassy, our primary rooster, was standing in the door way to the chicken part of the coop and Captain didn’t want to go past him. Instead, he flapped up on top of a straw bale. I picked him up, took him into the coop past Sassy, and set him on top of the doghouse in the coop. Chickens settling down in the evening. I told EJ that I always feel a deep sense of contentment when the chickens are all settling down in their coops in the evening. It such a cozy, homey feeling. In fact, it is very “warm fuzzy” to have the chickens run up to me when they see me. It’s often very difficult to walk in their area because they walk along with me, even stepping on my feet. I like chickens. They are interesting. The Constant Contact woman told me that she helps many people grow their businesses. Right now, craft businesses (like mine) are doing very well. She thought my items were beautiful/cute and very well photographed. “I’ve seen many craft products that aren’t photographed well, but yours look great!” She also asked me who designed my website. I said, somewhat sheepishly, “I did!” She said, “Oh! Wow! Well, you will certainly have no trouble using our services.” She made me feel very encouraged and proud of my accomplishments. She made me feel like “I can do this!” I am so thankful for these support people who are helping me set up my store. I couldn’t do it without them. Well, I’ve got to go back to work! My head is overloaded with information. This is Day 2 of my search for an e-store site. I almost, almost paid for an upgraded plan at Ecwid, which is the link I shared yesterday. I really like the professional look and friendly support there. However, I decided to do more research this morning to make sure I understood everything before I committed. I googled “best e-commerce sites,” and “best hosting sites,” and “reviews,” and all sorts of foreign words and incomprehensible concepts. I used chat support on a couple of sites to ask tons of questions. I let them know I was a “techno-dummy” and needed simple explanations. The support people I talked to were very patient in explaining things to me. If I understand it, there are a range of different types of options for different types of people. Some people like to have the flexibility and control to do their own computer coding, create their own templates, provide their own security, and so forth, so everything is exactly the way they want. Those people are knowledgeable about computers–graphic designers and such. I think that the companies that hosts these sites don’t provide much support, probably because they figure people know what they are doing. There are also people who already own their own websites but they just need a hosting site. I didn’t know what a hosting site was, but I learned that a hosting service provider is a business that provides the technologies and services needed for the website or web page to be viewed in the Internet. Websites are hosted, or stored, on special computers called servers. Most hosting companies require that you own your domain in order to host with them. I tried to move my WordPress blog to a new hosting site yesterday morning, but had problems importing my content and finally decided to remain where I am. I do really like most of WordPress’ features. Then there are people like me, who just want to have a company that provides the website, the hosting, the security, the support, and everything else. I want the store to be easy to set up and operate, and I want it to be a good experience for my customers. I think of it as renting a store in a mall. The mall provides the store, the security, the consumer traffic, and everything else. I just have to move in, list my products, and open the door. Some services are very expensive. I think they are for very high-volume businesses. I saw one upgraded plan that cost $299 each MONTH. My business is low-volume because I can only crochet so much in a month so I have to keep my costs as low as I can, while also having the store, the templates, the security, and the support I need. I learned that some sites appear to be low-cost, but there are hidden costs–like you have to buy plugins for functions like a shopping cart or payment and shipping methods–and those costs can add up. And some sites have very poor support services, a limited number of products you can list, or very limited storage space. I looked at several sites–I even got an account with some of them and began to set up shop. However, when I began to look more closely at them, I felt they wouldn’t work well. For example, one site seemed really good, but it required users to set up a VERY complicated and confusing shipping matrix. In searching for help, I read that many people got discouraged by the matrix and moved on. Including me. Another site seemed really good–it was family-oriented and for handmade crafts–but it didn’t look very professional to me. I want the “mall” that my store is in to be attractive and appealing. I loved the look of Ecwid at the link I shared yesterday, and their support was awesome, but in chatting with their representative this morning, I felt their focus was more on providing hosting for people who already had their own sites. I considered just upgrading to a WordPress Business Plan, but they prohibit the use of some plugins and features. While I don’t think I would be affected by those limitations, I do want to make sure that I’m not locked in and that I have the freedom to use features that I might possibility need in the future. So I kept looking, reading reviews and comparisons. I finally went back to the site where I had tried to unsuccessfully import my WordPress blog yesterday morning. I read that they are a really good, reliable, and affordable site. I went to their chat support and asked a representative tons and tons of questions to see if they had other options I could use, other than connecting my WordPress blog to their service. I told the guy that I no longer wanted to import my blog into them but, instead, I wanted a separate estore and I wondered if they provided a store (domain) I could occupy, and what were ALL their costs and fees so I wouldn’t be surprised, and did I have to buy the plugins to operate my business, were there any hidden costs or fees, was their set up simple and easy, and did they provide security and good support? I even asked the guy if there was anything he could tell/teach me that I was too ignorant to ask about. The guy was amazingly patient in answering my questions and finally recommended their starter plan, which looks really good to me. I only pay $6.95 if I subscribe for three years, which is very inexpensive. It goes back up to their regular price after three years, but that should give me time to build my business. I am going to ask EJ what he thinks about it tonight when he gets home. I value his input. I shared the link yesterday because I really thought I was going to use that place for my store. But now I’m not. Probably. I’m not going to share any more links until I know absolutely, positively, for sure, that that is where my store will be. I’m not any place until I am–until I sign the lease…er, subscription. Stay tuned…. EJ learned that he could work overtime if he chose, and since we could use the money, he worked last Friday. Later, when I got out of bed, I looked out the window and saw the Xterra parked near the top of the driveway, and the Suburban gone. It didn’t take a detective to deduce that the Xterra had gotten stuck so EJ drove our other vehicle. He said later that as he started down the driveway, the Xterra started sliding so he steered the other way and it got stuck in the snow. I think EJ has gotten stuck more this year than any other. I haven’t gotten stuck because I don’t make the attempt to make it down the driveway in the winter. The good thing is that neither EJ nor I ever engage in any sort of angry blaming when things like this happen. We just work together to resolve the problem. I went out in the afternoon and shoveled some of the snow away from the Xterra, and then later I steered the Xterra to safety as EJ towed it out with the Suburban. Easy Peasy. Although our driveway is a challenge in the winter, I really love our property. Our long driveway winds around and hides us from passersby. EJ says that our property is hidden like a delicious secret. And winter is very beautiful. This past week or two, the trees look like they are dusted with powered sugar. When the morning sun hits them, they radiate with a golden light. Sometimes the snow-covered trees look like glass when the sun shines through them. I also enjoy seeing the paths that the deer make in the snow, and the tracks from other animals. And, of course, the birds and deer come up to the house to eat from the feeders in the winter. We have to put the feeders away in the warmer months because they attract bears, and with no feeders out, the birds and deer tend to stay hidden in the forest. So there is a lot of magical beauty in winter. Normally we like to rest on Saturday, but I had to deliver the remainder of the baby outfits to my biggest customer. The yellow and green dress was the last of the six outfits she ordered, and the purple dress and two sweaters was ordered by her daughter. EJ and I delivered the items to the Grandma at the hospital where she works. After we dropped off the order, we went on to H&R Block to get our taxes prepared. Yuck. I had dreaded it all month, anxious that we would owe a lot. But, with relief, we learned that we are actually getting a refund. Whew. We were missing one form that we needed, so the tax preparer went as far as she could and then told us to schedule another appointment when we found the form. We drove home and found the form immediately. When EJ called to schedule another appointment, we were surprised to be able to get one for the same day. In fact, we had just enough time to get our coats on, jump into the Xterra, and drive back. It was really good to get that dreaded task crossed off our To-Do List. We spent the rest of the day watching a Netflix series while I crocheted a Big Foot that my biggest customer ordered–the same one who bought all the baby outfits. The Big Foot is adorable but I don’t yet have a photo of it. My customer also wants a Yeti and a unicorn. Sunday we drove to Meijers because EJ needed food for his work lunches. We stopped at TSC for poultry feed. The friendly cashiers greeted us when we walked in. I told them that I had just had a dream that we went to TSC during their Chick Days–when they have all the adorable chicks and ducklings for sale in the store. The cashiers said, “It is Chick Days now!” I replied, “I know, but in my dream, I resisted the temptation to buy some. However, then I discovered that it was also Puppy Days, and EJ and I couldn’t resist adopting a puppy.” The cashier said that Pet Adoption Day will soon be here. I asked, astonished, “You mean you really have a day when puppies are brought in for adoption?” She laughed, “Yes!” I didn’t know that. EJ and I decided that we better stay away from TSC on that day. We really don’t want a second dog but, after my dream, we don’t want to be tempted. After we got home, EJ went out to work on the Xterra while I worked on crocheting a Yeti. He came back in and said he needed a part from the auto parts store, so I lay aside my crocheting and went with him. This time we dressed Hannah Joy in her beautiful Nordic coat and took her with us. She lives to go places with us, although she also doesn’t mind staying home because we always give her a rawhide bone when we go anywhere without her. I have started singing the chorus to the silly children’s song, This Old Man to her: “With a knick knack, paddy whack, give a dog a bone, this old man came rolling home…” when I give her the bone. She carries to the couch in the living room and is unconcerned about us leaving her. A snowy drive to town. During one of our trips home from town, a bald eagle flew right in front of us and landing in a tree. It was totally awesome! Occasionally I see them circling over our enchanted forest. I’m always so thrilled to see them that I forget to get out my camera. I decided that today would be the day that I set up a new online store. I have been researching alternatives to Etsy because I am not happy that they have added on a bunch of (hidden) fees to items that sellers list. They also bury sellers who do not offer free shipping. I don’t like being pressured. I considered selling at Amazon, Facebook, and a few other places, but they either had high charges/fees or were complicated to set up. I want something more simple for me to set up and buyers to use. I think many of the more expensive marketplaces would be ok for businesses that sell many items, but not for a small business like mine. I would prefer to have a business through this blog, but WordPress doesn’t allow business plug-ins (which allows a blog to have shopping carts and payment and shipping options, etc.) unless a person buys their Business Plan, which I can’t afford at this time. I love WordPress, but wish they had a less expensive option for people like me. Maybe someday I can afford their Business Plan, but not now. This morning I learned that I could use WordPress through a different hosting site, which would allow me to set up a business. I explain it to myself as having a store at the same location but with a different landlord. One had good reviews and wasn’t too terribly expensive so I set up an account with them. I had chatted with their support person and asked tons of questions before I signed up. They said it would be easy to import all my WordPress posts over to their site. I could retain blog address, my theme, my formatting, and everything, they said. But apparent it is only easy if you are a techno geek and not a “techno-dummy” like me. I spent all morning chatting to the new host support staff and WordPress support staff, trying to export/import my WordPress posts over to the new site. I finally was somewhat successful–I got most of my posts imported, but all my posts after May 2018 were missing, and both support staffs said that there was nothing they could do about it. I don’t want to lose any of my posts or you, my followers, so I finally called it quits and cancelled the new Landlord. I will remain with WordPress and someday maybe I can afford their Business Plan. I made the mistake of beginning this endeavor as soon as I got out of bed this morning. I was so busy trying to get everything to work that I didn’t take a shower or get dressed until after 1 p.m. My first meal of the day was a cup of peanuts and jelly beans after I got dressed. Then I went back to it. After I cancelled the new Landlord, I went back to trying to find a place for a webstore. I found two possibilities. Both had good options and neither cost an arm or a leg. One was very family-oriented and was specifically for handmade craft items, which was appealing, but I didn’t think it looked as attractive as the other site. The second site had a free plan with no hidden fees, but the free plan only allowed for 10 items to be listed. EJ said to go for the upgrade. I hate to incur too many costs because my goal is to help supplement our income, not deplete it. However, EJ said that the money I made on the items I delivered this last weekend has paid for a year’s cost of the new site so I should go for it. I’ve begun developing the store and will upgrade to the better plan tomorrow. Right now my eyes are blurry from working nonstop at the computer all day. Ok. It’s late and I’ve got to get to bed….. I have been looking for an alternative to Etsy because Etsy seems to be charging a lot of fees. I’ve researched many and tried to configure a couple, but they all seem expensive or complicated. I’ve wanted to have my store on my blog, but WordPress requires that I upgrade to their Business Plan, which is too expensive. However, this morning I learned that I can create a store on my WordPress blog by switching to a new host. I chatted with support and they said it was easy to do, and that I could keep my blog address and my appearance. It wasn’t quite that easy and I almost gave up. Chatting with both Bluehost and WordPress support, I finally managed it (I think). However, it appears that I’m going to have to reset up the blog. It might get messy. Please be patient, dear followers, and I will get it set up as soon as I can. I appreciate you all! We’ve been having days of snow alternating with days of sunshine. Sometimes the temperatures warm up and cause the snow on the roof to melt and drip. Then the temps get low and re-freezes everything. I took this photo of icicles hanging from the roof like sharp fangs. Last night the temps plunged to -3(F) degrees. Brrr. It’s hard to believe that the southern parts of the USA are warming up and getting hot. Dale, the superhero neighbor, has snowblowed our driveway four times now! EJ was home one of the times he came up the driveway, so he went out to meet him. He found out exactly where the guy lives–just down the road and around the corner. He also learned that the guy is a veteran who lived most of his life in Connecticut. Dale said that people there aren’t as friendly or helpful like they are here. (His words, not mine. I’ve never been to that state so I don’t know what the people are like there.) He has a Midwestern attitude and likes to help out folks. When he saw me struggling to snowblow our driveway a couple of weeks ago, he added us to his list of folks to help out. EJ said he had been asking God to help us with a snowblower–he never imagined that God would send a man to do it for us. I told EJ that I wish there was a way to express our gratitude to Dale for snowblowing our driveway. Dale refuses to let us pay him but I wondered, “Maybe I could make him cookies…?” However, I never really know when Dale will show up and I don’t want cookies to go stale (or, more likely, get eaten) if there is a wait. I could buy him a box of chocolates? EJ said, “But what if he is trying to eat more healthily? What if he’s diabetic or something?” So I thought and thought and then decided that the next time I see Dale in his snowblower chugging up the driveway, I will run out and tell him that once the weather gets nicer and the chickens began laying again, I will give him free eggs whenever he needs them. Everyone could use eggs and the chickens give me an over-abundance. Because I took the wrong yarn sample with me when we went to the craft stores on Friday, I got the wrong skein of yarn and couldn’t finish a baby dress. So we had to go back to the craft stores on Sunday. This time I made sure I had the correct yarn samples to match, and I had EJ verify that they matched before I put them into my purse. A few minutes later, I saw Hannah on our bed chewing something that I assumed was a paper towel. She loves to eat them, and because she knows she’s not supposed to, she usually takes them to our bed to secretly enjoy them. Whenever I catch her, she keeps turning her back to me and clamps shut her jaws so I can’t pry the paper towel out. Hannah Joy is a stubborn lassie, but she keeps us laughing. I went into the bedroom to try to pry the paper towel from her jaws. However, instead of a paper towel, I found a piece of yarn dangling from her mouth. With effort I was able to retrieve the yarn, and discovered that it was the small ball of yarn I had just put into my purse so I could match the color at the store!!! Hannah is part pitbull. I call her my “pit-pocket” because she likes to steal Kleenex from my pockets and, if she has the opportunity, she steals stuff from my purse. A few months ago she got into my purse and ate a whole bag of cough drops!!! I have to keep my purse–and other tempting items–out of her reach, but sometimes I forget. Ugh. I imagined driving all the way into town to the craft store and not finding my yarn samples. I also imagined Hannah pooping out yellow yarn. Sometimes I feel like Steve Irwin, observing animal poo to see what she’s recently eaten. I put the yarn sample back in my purse and put my purse out of Hannah’s reach until it was time to leave. Hannah always gets excited when she sees us preparing to leave the house because she gets a bone to chew on. If she’s busy chewing a bone, she isn’t getting into things. 🙂 Once she has her bone, she takes it to the couch and hardly notices when we leave. EJ and I made it to the craft stores with the yarn samples and I was able to match them. I had two colors of yarn that I needed. I found one at Michaels and the other at Joann Fabrics. I had a 40% off coupon at the first store and a 25% coupon at the other. Now I can finish my projects. In-between crocheting and visiting craft stores this weekend, I re-organized our spare bedroom, which is our office, library, and craft room. I put away things that had accumulated on the desk, filed papers, and straightened up the closet. In the closet, I have shelves to the left and right of the door to hold my yarn, with excess yarn in totes. I keep a limited inventory of finished products in totes on the upper shelf. My on-line medical transcription class is nearing its end. I took my final exam this morning. I did my best and scored quite highly, but I didn’t really care about the grade as much as the information. I do not plan to go into medical transcription because I would have to become much more familiar with medical vocabulary, the human body, and diseases. I don’t really want to be immersed every day in the suffering of people. However, I printed off all the class information and filed it in case I ever decide to get into general transcription. Right now, however, I’m enjoying earning a bit of money with my crocheting. We’ve actually had a couple of days of almost sunny weather! I like when the sun shines on the snow and makes it glitter. This morning the snow was so glittery that it looked as if we had mounds of magic fairy dust covering the ground in our Enchanted Forest. It clouded over this afternoon; tonight we are supposed to get another two inches of snow. This morning EJ and I delivered five baby outfits to the woman who ordered them. I still have one more to make for her, and I also have to make a baby dress and two sweaters that her daughter ordered. We met at the hospital where the woman works. She opened the box and held up each dress for the other people in the waiting room to see. She told everyone that I do really good work, and she described the baby blanket I made for her last month, as well as the crocheted animals and Michigan monsters. One man asked, “How much do you charge for a Big Foot?” I told him I don’t know yet because I haven’t made one yet–I’ve been busy making baby clothes. But I told him the name of my Facebook page. As we drove away from the hospital, EJ and I decided that I should make some business cards with my websites and Facebook pages listed on them to hand out to people who show an interest. The trip to the hospital was a real spirit booster. If anyone would like to buy dresses like these, message me. I can make them in (almost) any color you choose. I needed yarn for the other items I’m making so after we delivered the items, we visited Meijers, Joann Fabrics, Hobby Lobby, and Michaels. We really only needed to go to Meijers and Joann Fabrics, but a Hobby Lobby store has just opened in Traverse City, and we’ve never been to a Hobby Lobbys so we decided to stop in. I think we wandered around in the store for three days and three nights looking at all the items. Ok, maybe it was only an hour, but it felt as if we were lost in there. We didn’t buy anything, we just wanted to see what they had. I think each of the craft stores offer many similar items, but each also offer things that the other stores don’t. We didn’t buy anything. Afterwards we stopped at Michaels to get some yarn. We were exhausted by the end of our craft stores exploration. When we finally reach home, EJ carried in the items while I took Hannah Joy outside. Then EJ made us sandwiches while I put stuff away. We work well together. I had thought that I was quite clever and “with it” to think of bringing along a piece of yarn to match for one of the baby dresses I’m in the process of making. I need just enough more yarn to make the sleeves. We perfectly matched the yarn strand, but when we got home I discovered that I had taken along the wrong piece of yarn. So we will have to go back out on Sunday to try to find the yarn. I can’t remember which store I bought it at. The only thing I’m sure of is that I didn’t find the yarn at Hobby Lobby. I’m hoping we don’t have to stop at all of the other stores before I find what I need. It would be easier if I still had the label, but I can’t find it. Some of the labels easily fall off, even in the stores. Sigh. Well, I can work on the other outfits this weekend. And EJ and I did have fun hanging out together. This evening I made popcorn and EJ and I watched Amazon Prime videos while Hannah Joy slept on my lap. Yesterday morning when I went out to the garage to feed our outside cats, Miss Madeline Meadows came running up to me. It’s a relief to know that she is really, truly alive and well. EJ told me later that the “body” that I mistakenly thought was Madeline’s (i.e., the carpet remnant) does not count as one of her nine lives. LOL. Yesterday was a sunshiny day, but it snowed during the night and throughout this morning so we gained some additional inches of snow. The snow has piled up around the garage door and I have to shovel the snow away from the gates going into the garden and poultry pens so I can get to the coop to care for the chickens. The raised beds in the garden are now almost hidden by the snow. I imagine the garden plants all snug in their beds, covered in blankets of snow. If it keeps snowing, the bird bath in which I put the corn for the deer will get lost. My computer put together the following video from photos I took today. I couldn’t clear the driveway today because EJ has not yet replaced the broken pins on the snowblower. I really didn’t want to ask him to do it last night when he was so tired from working his ten-hour shift. I was hoping the snow wouldn’t pile up so much that EJ got the Suburban stuck in the driveway when he came home from work…and then I saw the mysterious neighbor’s large tractor-snowblower blasting away the snow as it crept up the driveway. Last time the guy snowblowed our driveway, I neglected to ask him his name because I was embarrassed. It’s not as easy to meet our neighbors as it was when we lived in town. EJ has met several of our neighbors, but I’ve only met the guy who lives across the street. When we encountered him at Costco a couple of months ago, I didn’t even recognize him because I’ve only met him up-close once. Usually we just wave to each other when he’s working in his yard when I’m getting our mail from our mailbox. Our closest neighbor, who shares our driveway, is there only a few weekends in the summer for his vacations. The neighbor on the hill across the road often goes to Florida all winter–and his driveway is also long and steep. The other neighbors all live further down the road. So I didn’t ask the mystery neighbor his name last time because I thought, ugh, wouldn’t it be embarrassing if it was a neighbor I had already met and I just didn’t recognize him? But today when I saw him coming up the driveway, I scrambled into my coat and boots and ran out to talk to him. I asked him his name and where he lived. He’d only say that his name is Dale and he lives on one of the nearest cross roads. I told him how much I appreciated him snowblowing our driveway and asked if he would accept any sort of compensation–money for gas? homemade cookies? something? But he refused. He said he just enjoys snowblowing neighbors’ driveways. Dale is my newest favorite neighbor. He makes me re-believe in the goodness of people. Late this morning I studied the last lesson in my Medical Transcription class. Now I just have to study for and take the final exam. I have printed out all the class material in case I want to pursue transcription, but at this point I want to focus on selling my crocheted items. Even if I do go into transcription, I don’t think it will be in the medical field because there are too many medical terms to learn. Plus, I’d have to become familiar with a lot of medical problems so I could catch mistakes in dictation, and it makes me sad to read about people’s suffering. I don’t want to know that Mrs X is a mother of small children and has inoperable cancer or anything. I spent most of my afternoon looking into alternatives to Etsy. When I first joined Etsy, I only had to pay a small fee each time I listed an item. It used to be that the full amount a customer paid for one of my items would be deposited in my account and I’d use some of it for shipping and the rest was the actual amount that my item cost–for example, the customer would pay $5 for the item plus $4.06 shipping for a total cost of $9.06. However, I’ve noticed during my last few sales that I’m only getting a portion of what the customer paid. The customer paid $9.06 but Etsy only gave me $6.49. I still had to pay $4.06 to ship the item, which means that out of the $9.06 that the customer paid, I only actually received $2.49 for the item I sold–and that doesn’t even include the cost of the initial listing fee! That barely covers the cost of the supplies I used. I learned that Etsy is now charging a lot of fees: a listing fee, a transaction fee, a shipping fee, and a fee for who knows what else. And then there’s the fee Paypal charges for each transaction. I’m don’t mind paying reasonable fees because the people running the sites aren’t operating a charity–they have to earn a living! But I’m being fee’d to death! The only way that I can afford to sell on Etsy these days is to charge a huge amount for an item to cover the cost of shipping and all the fees. I feel disgusted. I mean, I’m trying to help support my family. I can’t afford to lose money on the items I make. I feel an urge to have a Tea Party. In Boston maybe. Etsy keeps declaring that customers will feel they are getting better value if the shipping is free, but I think they would actually be receiving a greater value if sellers didn’t have to charge so much to cover the fees. Furthermore, I don’t get many sales at Etsy because unless I offer free shipping, Etsy doesn’t promote my store, which means I get lost in the crowd and I get fewer visits and sales. I’ve been working hard and selling many items over the last few months, but almost everything I’ve sold–like 99.9% of them–has been by posting my items at the local buy/sell groups at Facebook. So I’m searching for a new on-line marketplace to sell my items through–one with not so many fees nibbled out of me and where I can get noticed. I’ve found a few possibilities. I’m also considering advertising at Craigslist or posting signs at local store bulletin boards. Once I choose where I will sell my items, I’ll close out my Etsy store. I’ll share links to the new marketplaces here on my blog. Do any of you sell items on-line? What site do you use to do so? Ok. My rant is over. The day had some major frustrations but also some tremendous blessings–such as finding Madeline alive and well and having our driveway cleared by the Mysterious Dale. We sure had some crazy weather this last weekend. Friday night it rained. I don’t know how much we actually got, but I read that we were supposed to get about a half-inch. Saturday morning it switched over to freezing rain, then to snow. In the afternoon the wind really picked up to around 35 mph with gusts over 50 mph. The strong winds blew through Saturday night and through Sunday. It was still quite windy today, but not as bad as the previous days. During the weekend EJ and I sat safely in our cozy house and watched the wind sway the trees and blow the snow like ocean spray past our windows. EJ made preparations in case our power went out, but we never lost it, although many others did. The little town two miles away didn’t get power restored until this afternoon. Before the blizzard hit, EJ had parked the suburban further down the driveway to give him a better chance of getting out for work this morning. With all the drifting snow, however, he still wasn’t sure this morning if he would be able to get out. I watched him walk down through the deep snow to the Suburban this morning. He later told me that he had plowed through the snow like the Duke boys on the old TV series, The Dukes of Hazard. He was able to get to work and home again safely. Early this afternoon I went out to snowblow the driveway so EJ wouldn’t get stuck when he got home. EJ had said that I didn’t have to do it at all, but he instructed that if I did, only do the very bottom of the driveway so he could park the Suburban. I was a little nervous because I had noticed thick ice under the snow when I walked down to get the mail. Ever since I fell on the ice last winter and broke my wrist, I get nervous when there is ice. I got the snowblower out of the garage and started it up, but I noticed that it wasn’t blowing the snow. Sometimes the pins holding the blades get sheared off, which means that the blades don’t spin and blow away the snow. Apparently it’s an easy fix, but I don’t know how to do it so I have to wait for EJ to replace the pins. I was sighing with a bit of frustration because if I couldn’t clear the snow, there was a good chance EJ would get stuck in the driveway when he returned home, and then we’d be out there working in the cold and dark to get the Suburban unstuck. I turned off the snowblower and was about to push it back into the garage when…what to my wondering eyes should appear? A large tractor-snowblower coming up the driveway blasting the snow away! My jaw dropped in amazement! I had to rub my eyes with my mittened hand to make sure it wasn’t a hallucination! It wasn’t! I waited for the guy to reach the top of the driveway and went over to talk to him. He said that last week he saw me snowblowing when he was clearing a driveway down the road, and he thought I could use some help today. I thanked him profusely. The snow was so deep–with ice underneath–and it would have been an awful ordeal to clear even a little bit. When I stepped back, the man went back to work. In no time at all he had the whole driveway cleared and then he was gone like a masked Superhero. I don’t even know his name, but I assume he was a neighbor I haven’t yet met. Later, EJ was able to make it all the way up to the house with no problems. What a blessing! Sunday EJ and I watched a few crows swooping past the windows to land down on the other side of the driveway, just below the hill. It was amazing watching them gliding so close to the house. I like crows. Today I saw a crow sitting on a power line post with something large in his mouth. Then he swooped down to the same place he had yesterday. I looked out the window and was able to glimpse a dark spot on the snow so I figured the crows were eating an animal carcass. After the Superhero with his powerful snowblower had disappeared in a cloud of snow, I went out to see what the thing was. It was flat and had the same coloring as Miss Madeline Meadows. Concerned, I went into the garage and looked in the warm house that EJ had made for the outside cats. Only Annie was in it and I didn’t see Madeline elsewhere in the garage. I opened the small garage door that has the pet door in it. The snow had drifted deeply and there were no cat tracks in the snow. So I deduced that Madeline had been killed, and that the swooping crows I had enjoyed watching had been eating her, which is rather sad to think about. I was a bit surprised that Madeline’s body was so quickly in the state I found it: flat and stiff like an animal hide. But who knows how quickly the cold, rain, ice, snow, wind, and eating crows could destroy a body? Saturday evening when EJ and I took Hannah out, I noticed Hannah staring intently so I shone the flashlight and saw Madeline sitting on the rocks. She looked creepy, like a scary serial killer in the night. Today I thought sadly that I probably should have taken her to the garage then so she would have been safe. But, no, Madeline lets me give her lovings when I bring her food in the garage, but she is timid and runs away outside. She is totally an outside cat by nature and half feral. The animal shelter where we had adopted her had said that she had been returned twice because she was unhappy as a house cat. So I wouldn’t have been able to catch her even if I had tried. Madeline a few weeks ago, sitting on the gate entrance into the garden. When EJ got home tonight, I led him over to the body. He looked at it, poked it, and started laughing. “That’s not Madeline! That’s just an old piece of carpet from the Suburban that I used to try to get unstuck the other week.” It must have got flung into the snow when he spun the tires. “But why would crows take away pieces of old carpet?” I asked. EJ shrugged. “Who knows. Crows are intelligent so maybe they were playing with it. Or maybe using it for a nest or something.” But, whew, it wasn’t Madeline. She is a very intelligent cat and street (or forest) smart so she’s probably holed up somewhere safe. Or she is light enough that she could walk across the crusty snow to and from the garage without leaving tracks. I love EJ’s work schedule at this new company–four 10-hour days with a three-day weekend. I must admit, though, that it’s difficult to keep track of the days of the weekend. It’s like having two Saturdays, and I’m never quite certain if it’s first Saturday or second Saturday. I’m sure I’ll adjust over time. 🙂 I love having EJ at home for an extra day. For the last couple of days the weather has been sunny and quite warm–nearing 40 degrees (Fahrenheit). Yesterday I opened the chickens’ little private entrance to bring some fresh air into the coop. My chickens could go outside if they wanted, although they never leave their cozy coop when there is snow on the ground. Apparently, they hate northern winters and would rather spend the season in Florida like other less hardy Michiganders. EJ and I spent yesterday morning–our first Saturday–running a few errands in Traverse City. Mostly we just wanted to get out and enjoy the sunshine. Plus, we really enjoy hanging out together. Hannah Joy wanted to come with us, but we placated her with a rawhide bone before we left. When we returned home, I found a message at Facebook from the woman who has ordered six crocheted baby outfits from me. She wanted me to call her back as soon as I had time. I anxiously thought, “Oh, no! She has decided she doesn’t want the outfits and is canceling her order!” But that wasn’t it at all. She told me her daughter wanted me to make three outfits for her soon-to-be-born baby–a dress and two sweaters. Her Mom sent me pictures of the items her daughter likes. I have to see if I can find patterns. These are the baby outfits I’ve completed thus far. They all have matching booties. I try to use the colors the woman said she liked, but vary the combinations and styles. Eventually, I’ll get these dresses available at my Etsy store. After lunch, while I sat and crocheted, EJ drove our trash to the American Waste facility. At his previous job, the company let employees bring their household garbage to their dumpster so we didn’t have to pay for waste removal. When he lost the job, we had to figure out what to do with our garbage. We didn’t want an additional bill so when we had accumulated enough bags to make it worthwhile, EJ drove to the facility to drop them off. It’s much, MUCH cheaper that way and we decided to just continue doing it from now on. If we had waste pickup, EJ would have had to put the bags in the Suburban to drive them to the bin at the bottom of the driveway; it’s not much more of a bother to actually drive it to the facility, especially since he has Fridays off. The snow won’t be as much of a problem as the ice and the high winds. Ice will make our driveway treacherous. It can also weigh down the trees, making them easier for the high wind to knock over. This morning EJ filled up both vehicles with gas, made sure we had enough propane in case we lose power, and parked the Suburban at the bottom of the driveway so that we can get out if the driveway gets icy or the trees fall across our driveway. A chainsaw has been on our “to buy” list since we moved here, but we don’t have one yet so it would be disastrous if a tree blocks our driveway. Hopefully no trees will fall in our driveway or on our house, chicken coop, or fenced garden. Since we live in a forest, falling trees are a concern in high winds. With our storm preparations complete, we are hunkering down in our cozy house. Hopefully we won’t lose our power–or Internet. But if we do, we will be ok.